All items with envelopes include brown kraft or white envelopes as standard and satin ribbon or twine if applicable. Special finishes & embellishments such as diamanté, lace, silk & coloured envelopes are available at an additional cost. Choose from save the date postcards or magnets. 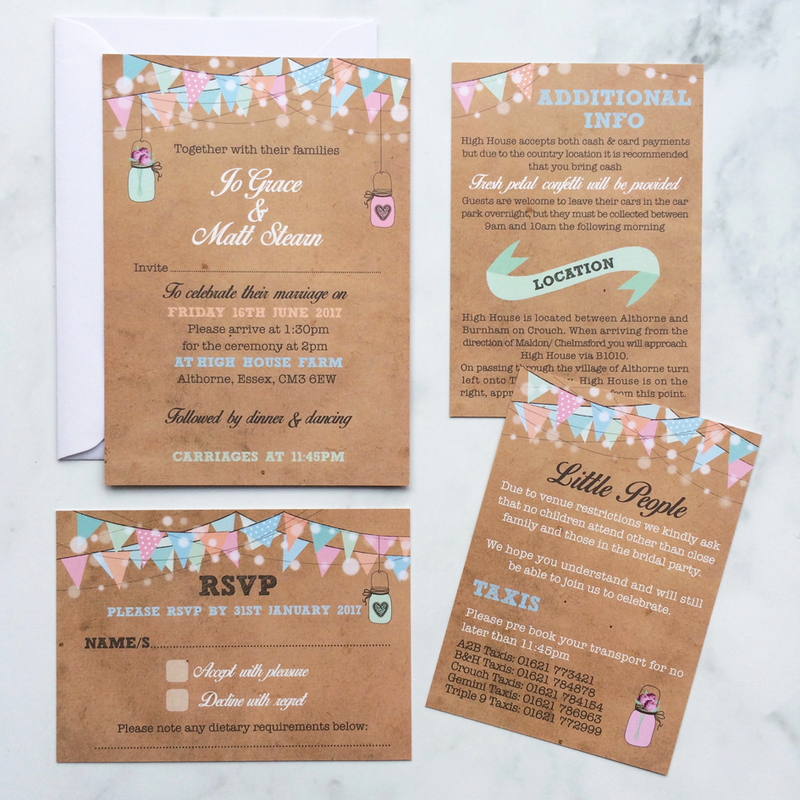 Flat day or evening invitations, with or without inserts and RSVPs. Watercolour Floral Pink & Rose Gold. Available as save the date magnets, gatefold Invitations with: inserts, an RSVP postcard, initial card, satin ribbon and a belly band. 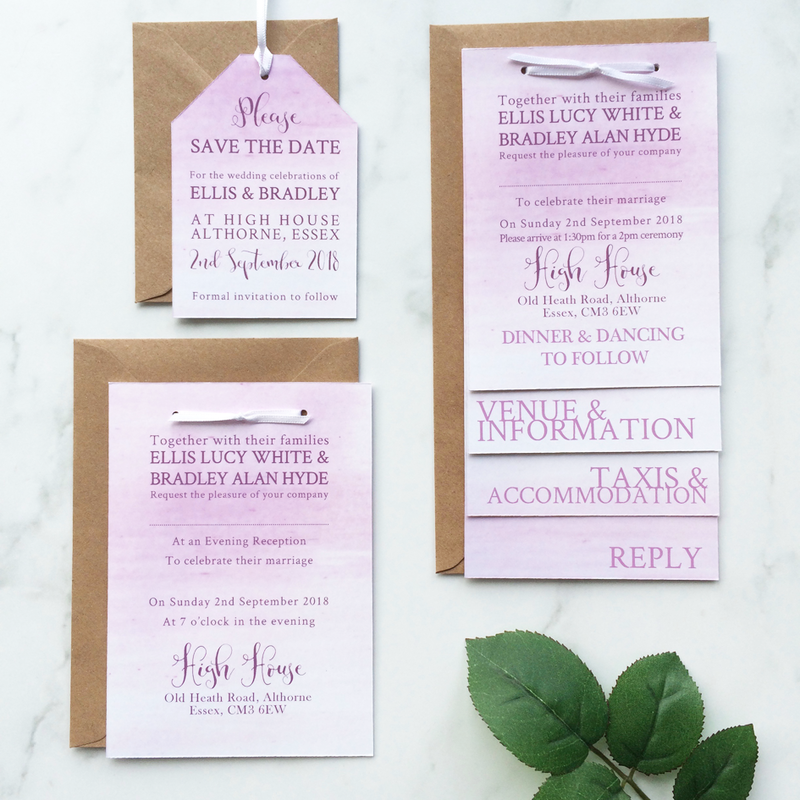 Flat evening invitations with or without inserts and RSVP postcards complete the collection. Elegant save the date postcards. 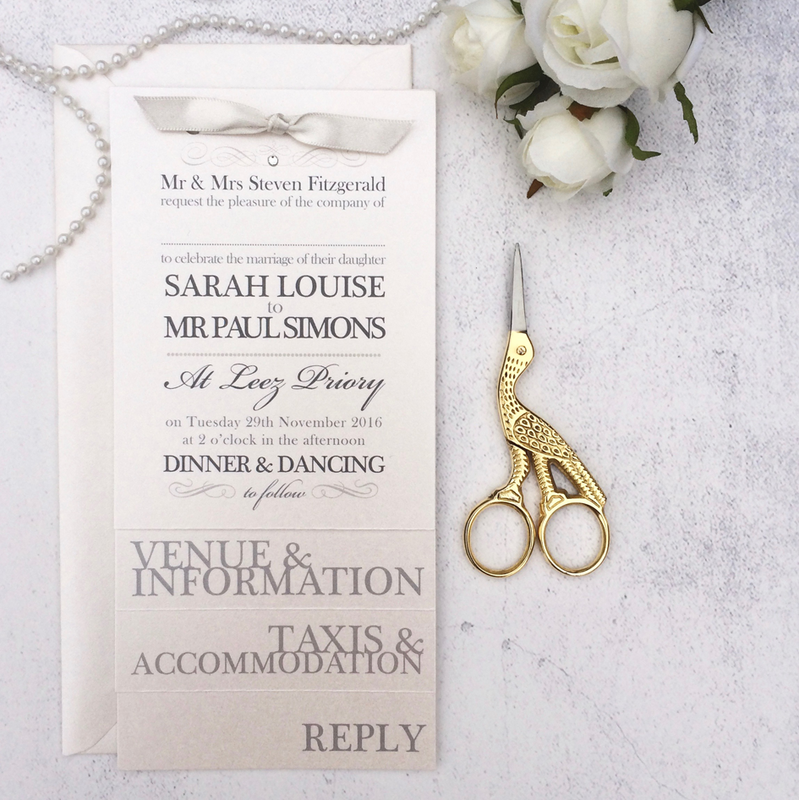 Booklet day or evening invitations, made with three or four pages, including an invitation page, pages for additional information such as accommodation, taxi details, gift list or a menu and a detachable RSVP postcard with your address printed on the reverse, fastened together at the top with a beautiful satin ribbon knot. Flat invitations are also available. ​ This collection is beautiful printed on a matt stock but also looks stunning printed on pearl with a single diamanté embellishment! Available to order JANUARY 2019. In the meantime please contact me to directly to order. This fun, bright ticket style collection includes, save the date magnets and ticket style invitations, with a detachable RSVP postcard. 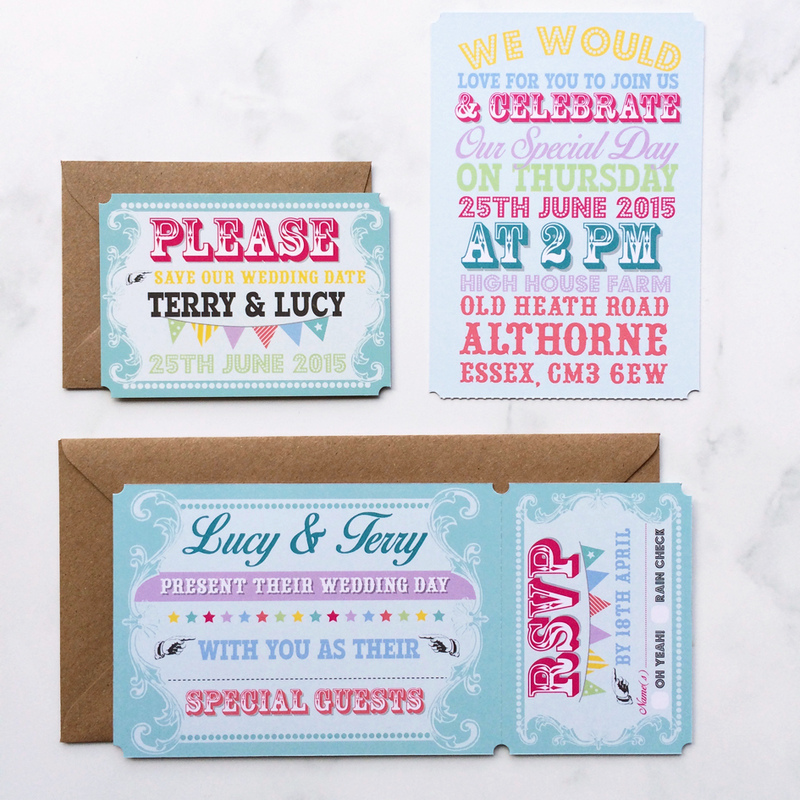 This collection includes, save the date magnets and flat invitations, which are available with or without inserts and RSVP postcards, an initial card, ribbon and belly band. The suite below features a silk ribbon instead of satin for that little bit extra. Choose from save the date postcards or magnets. 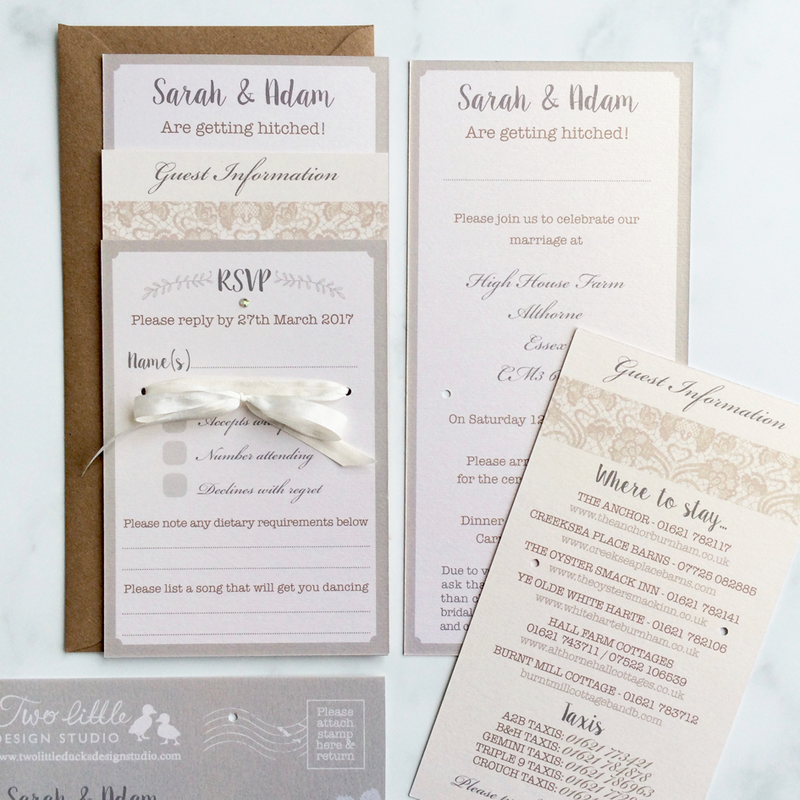 Flat day or evening invitations with or without inserts and RSVP postcards. ​Save the dates are available as a calendar with an optional pencil or magnet. 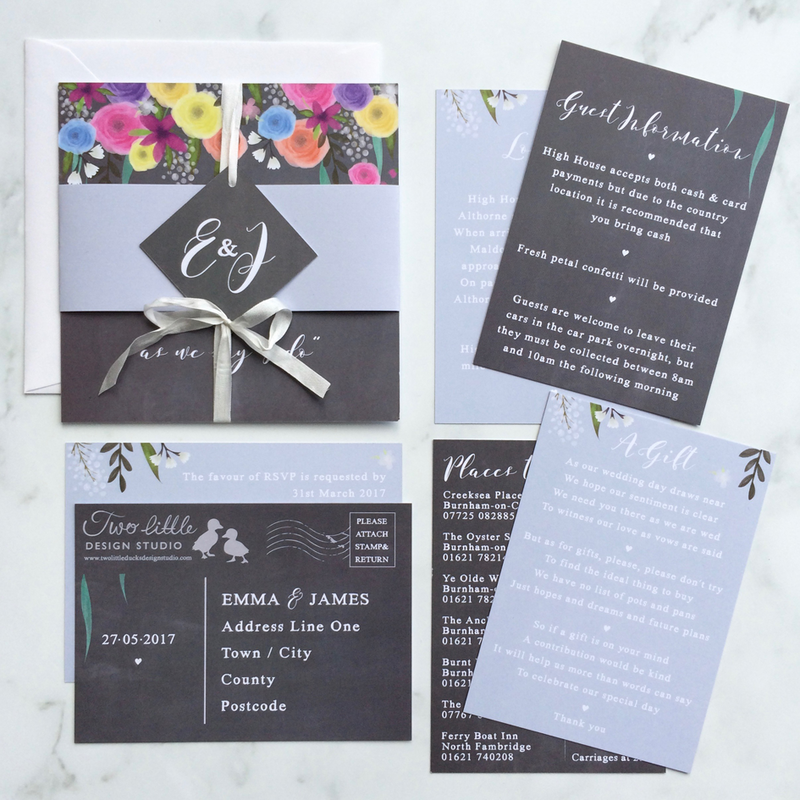 Flat day or evening invitations with or without inserts and RSVP postcards. 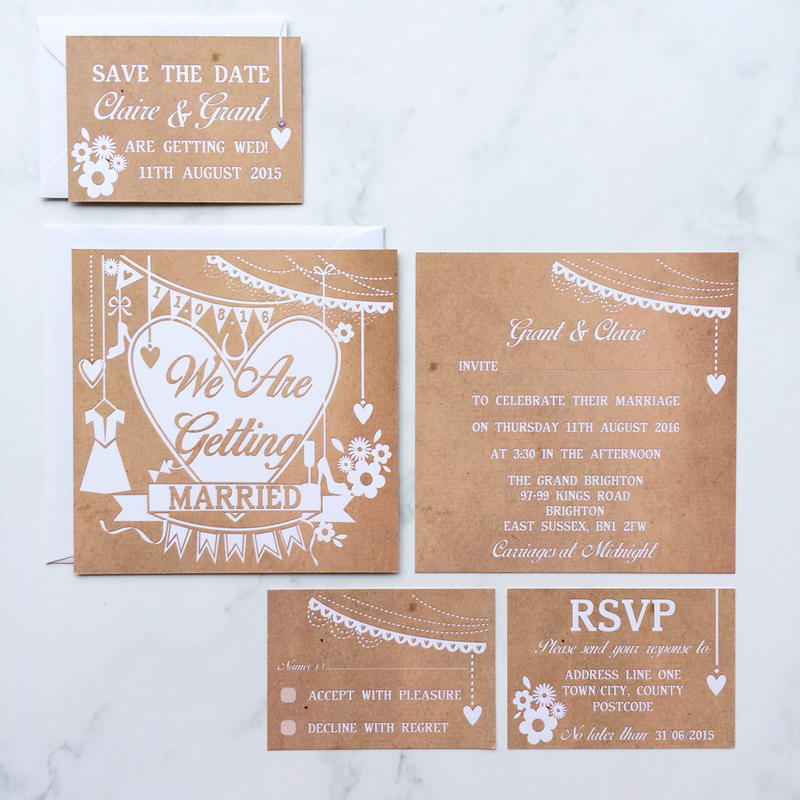 ​Finish these small save the date cards off, with a single elegant diamanté embellishment! Flat invitations available for day or evening guests and can be produced with or without inserts and RSVPs. Watercolour Floral Grey & Ivory. ​Available as save the date magnets, gatefold invitations with: inserts, an RSVP postcard, initial card, satin ribbon and a belly band. 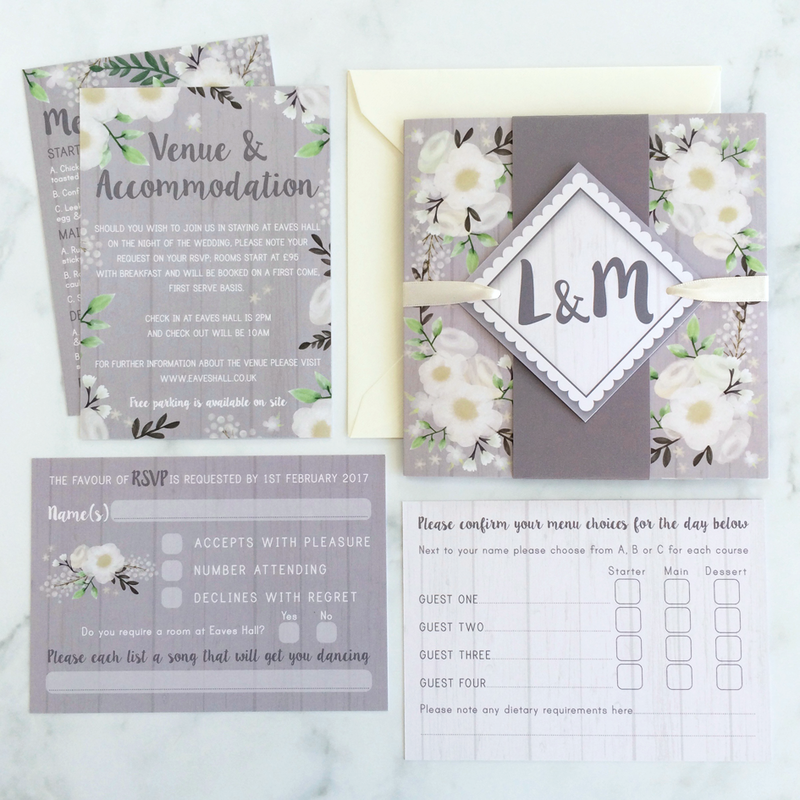 Flat evening invitations with or without inserts and RSVP postcards complete the collection. ​Save the date cards can be made with twine and luggage corners at an additional cost, or as standard with square corners and no twine. The booklet day or evening invitations include: three, four or five pages. Page one is generally the invitation, the inside pages hold any additional information and the back page is a detachable RSVP postcard. The booklets are finished with luggage tag corners and tied with brown twine. Flat invitations are also available. ​The save the date card can be finished with a silk bow or left as a printed card. 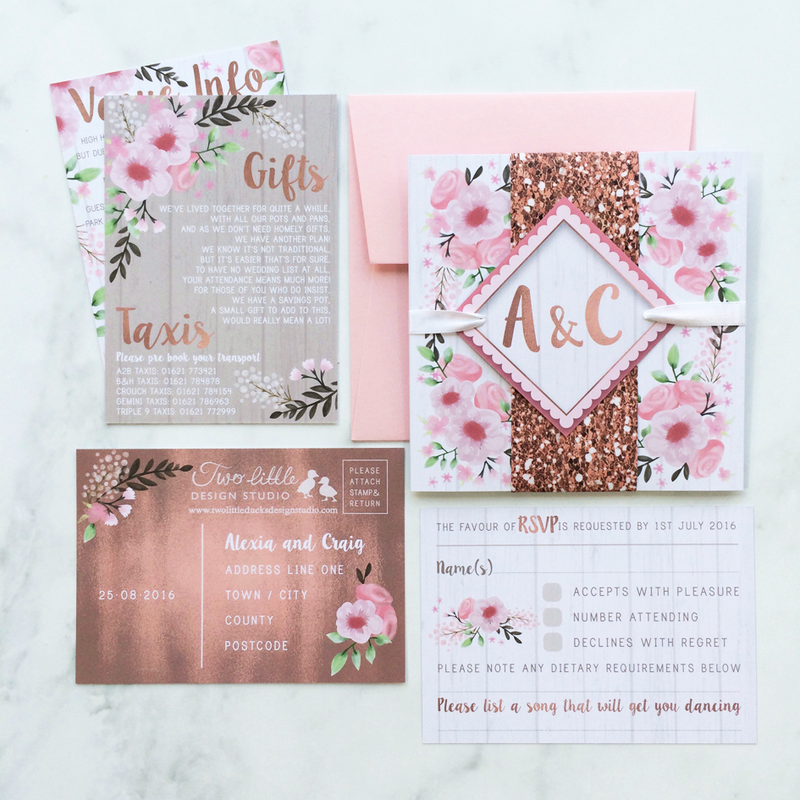 These stack invitations consist of three pages, including an invitation, additional information and an RSVP postcard. As standard they are fastened with satin ribbon but can be upgraded to silk or lace at an additional cost. This collection looks very striking when printed on a matt pearl and finished with a single diamanté upgrade. 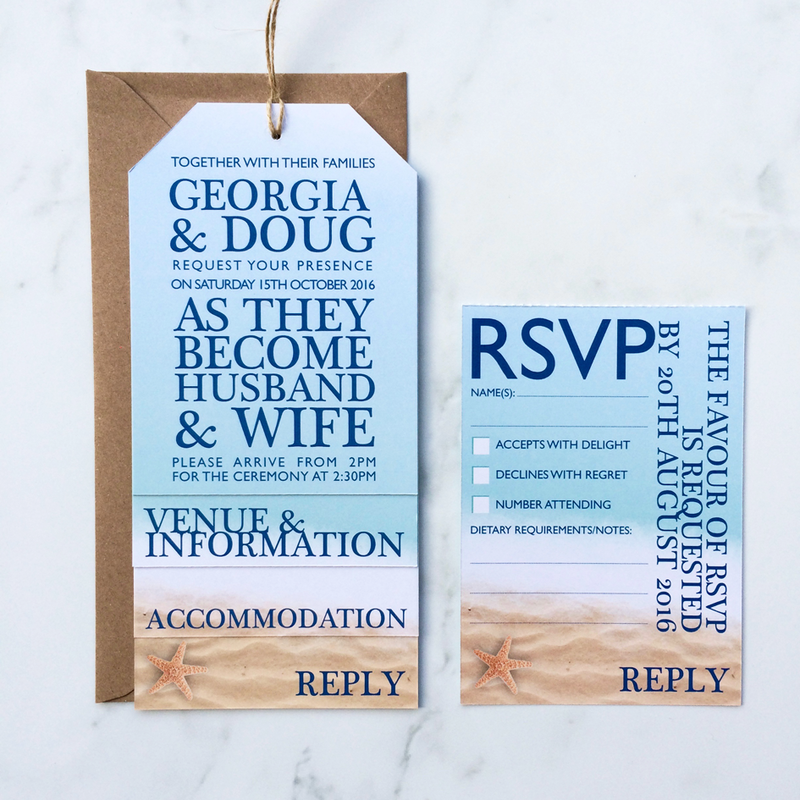 The flat invitation can be produced with or without inserts and an RSVP. 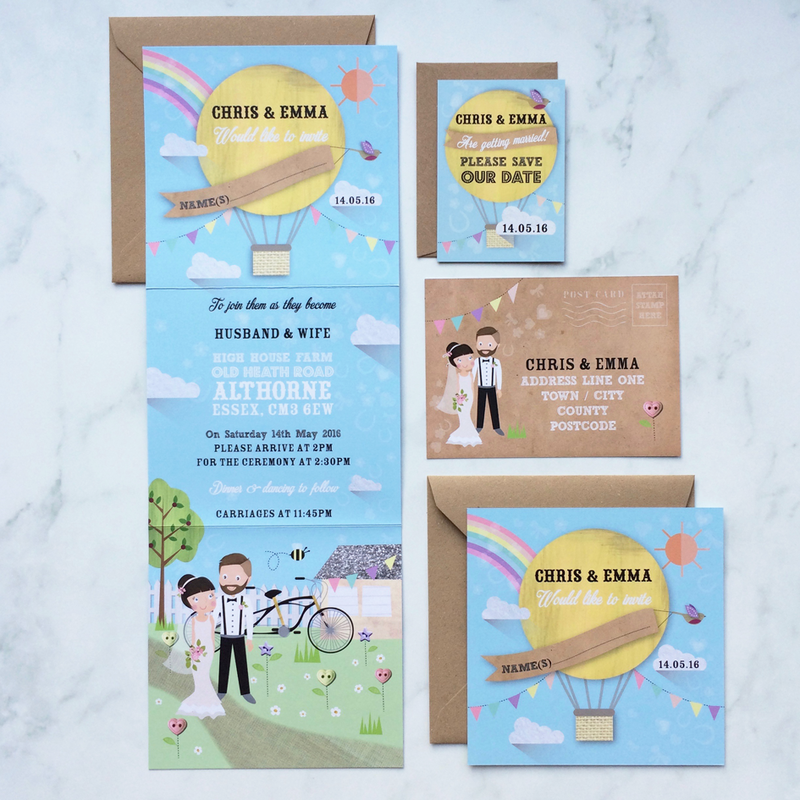 ​Tell your story with this fun suite, produced as save the date magnets and trifold invitations, with additional information printed on the back and complete with RSVP postcards. Also available as flat invitations with or without inserts and RSVP postcards. ​Finished with luggage style corners and available as, save the date luggage tags with satin ribbon, booklet day or evening invitations with three or four pages, including a detachable RSVP on the back and fastened with thin satin ribbon, or flat invitations also tied with thin satin ribbon.